Third was is to change the system utility C:\windows\system32\sethc.exe to, for example, �cmd�. If you log out after this and push �Shift� couple times than the console under the system authorities is appeared.... You need to run some built-in commands from an elevated Command Prompt in Windows 10. For example, if you try to run ipconfig/flushdns to flush dns and then re-register dns, the normal CMD reponds the requested operation requires elevation, due to lacking of administrator level privileges. This How-to will show you the proper method to run the MMC with an elevated administrator account, prompting for a password every time. Edit: Just to make this clear; this creates a shortcut so you only have to enter your admin password. Third was is to change the system utility C:\windows\system32\sethc.exe to, for example, �cmd�. If you log out after this and push �Shift� couple times than the console under the system authorities is appeared. I have to give it admin rights (elevated privileges) using compatibility tab. After which program finally runs with elevated privileges but I got an UAC message. So, I disabled UAC for Administrator account and Now, It runs with elevated privileges and no UAC message. 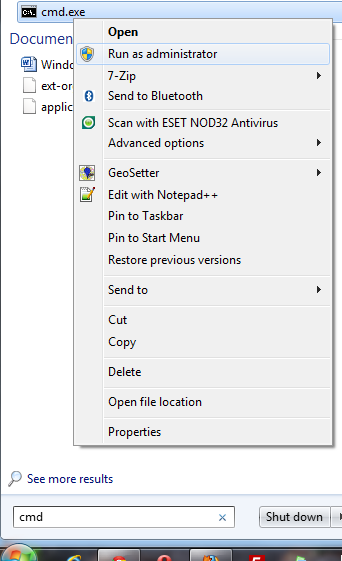 Elevated command prompt Updated: 10/30/2017 by Computer Hope The elevated command line , elevated command prompt or elevated mode is a mode introduced with Windows Vista that allows the user to execute commands with administrative privileges. According to documentation, the Windows security model... does not grant administrative privileges at all times. Even administrators run under standard privileges when they perform non-administrative tasks that do not require elevated privileges.